IO! 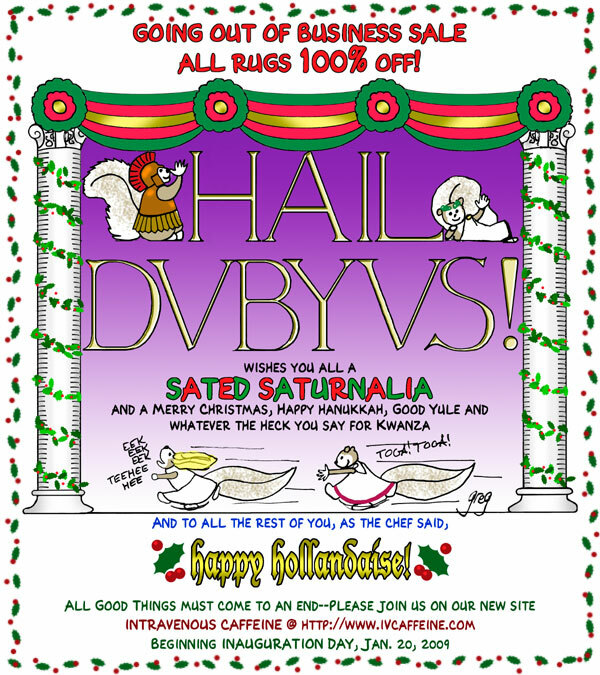 SATURNALIA! The Holiday Designed to Offend … EVERYBODY! Well, folks, it’s Saturnalia time again. I started wishing people a Sated Saturnalia when everyone and their brother started getting offended by one holiday or another. You can’t say Merry Christmas or the Jews will be upset, you can’t say Happy Hanukkah or the Muslims will get upset, Black Americans want you to recognize Kwanza, Wiccans want you to recognize Yule, and atheists get mad if you wish them ANYTHING. Therefore, I resurrected Saturnalia, the Roman holiday celebrating the overturning of the established order of things–to be celebrated in the worst taste possible. This year it is appropriate, since the Masters of the Universe have had their collective asses handed to them and the Republican cabal has finally been turned out of the government. During Saturnalia, the slaves took the places of the masters–and we have our first President from the race that was brought to this land as slaves. Saturnalia was a time of feasting and license. All the mores were overturned and all the prigs of the Roman world were duly horrified. It was the favorite holiday of the year. And at this time of the rolling year, it is meet that we should overturn the old in favor of the new. Little did I realize five and one-half years ago that I should still be drawing HAIL DUBYUS! today. Fred and Bert Squirrel joined the team on September 20, 2003, bringing with them their occasional drop-in friends Priss and Randy. I thought sure that our modern Commodus would be turned out after four years, but I reckoned without the Fates. But finally we will no longer be be guided by Capt. Wrong-Way Peachfuzz…and suddenly, the name of this cartoon dedicated to his imperial rectalness, HAIL DUBYUS! is obsolete. Nonetheless, SOMEthing is still needed, as we will be dealing with our dubious (Dubious–Dubyus, get it?) legacy for some time to come. 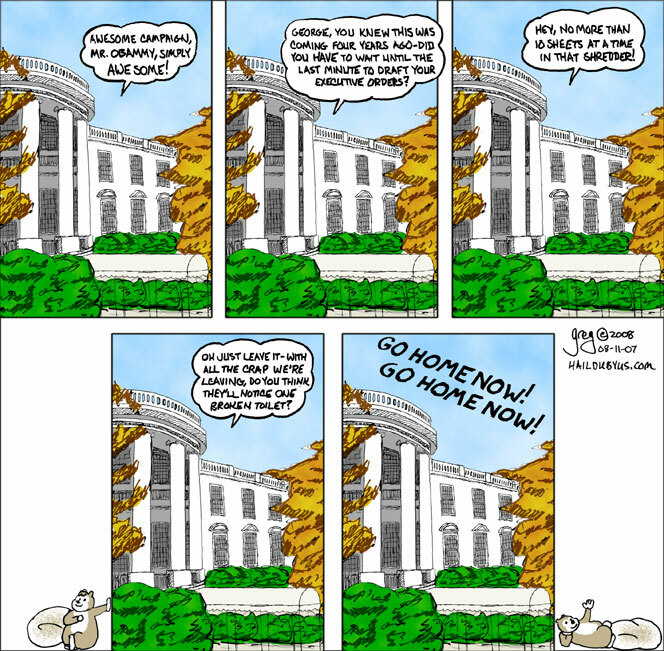 Although Mr. Obama has promised change, something tells me he’s going to need a jolt from an electric cattle prod every once in a while when the mainstream media yell too loudly that we’re a center-right country and anything but staying the course (not doing anything) is too radical. Sadly, HAIL DUBYUS ran into some hard times when someone at HOOmonGLEous Search Engine decided to marginalize it by eliminating nearly all of its cartoons from its database. Despite my efforts, to this day only a handful of my 700+ cartoons remain in its Image Search engines where 2-1/2 years ago there were over 400. So this may be seen as an opportunity to kill two birds with one stone. Intravenous Caffeine will have its inaugural issue on–Inauguration Day, January 20, 2009. It will offer more cultural and social commentary as well as political…or just be goofy as the fit moves me. Fred and Bert will be joining me there, as well as Mr. Dymme, who seems to have been showing up with greater and greater regularity for a while. 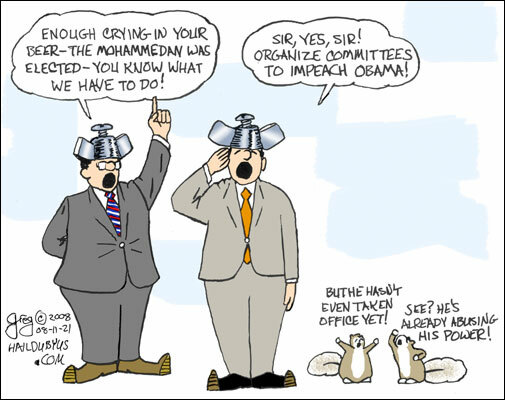 Well, it’s official–calls for Obama’s impeachment have begun before he’s even spent a day in office. YOU HEAR THAT, NANCY PELOSI??? You didn’t want to be divisive? Well, here’s the people you didn’t want to drive away–the ones who are willing to drive away a validly elected President before he’s even had the chance to be corrupt or incompetent. The least you can say is these guys aren’t racially prejudiced–they hate anyone who isn’t Republican regardless of race, color, creed, gender, sexual preference, or … well I can’t say national origin because that’ll probably be their argument: that Obama wasn’t legally elected because his original Hawaii birth certificate is missing and he can’t PROVE he’s a natural-born American citizen (despite having an American citizen mother). At least they aren’t calling for his assassination (or “merely” running pools for one). Quite frankly, with all the death threats he’s already received, I wouldn’t take bets against some gun-toting Mer’can patriot taking a potshot at the “Communist Nazi Muslim N-word whose minister hates America.” It may turn out that the one thing the Bush Leaguer did right was to allow his paranoia to demand increased security for the president…not for him, but for his successor. Some of us are going to be living on pins and needles for the next 4 years. The end is finally in sight for the Bush administration. One of the first things that is going to have to be done when Obama takes office is to find out just what the hell were in all those signing statements. And what kind of executive orders is Cheney is going to induce Georgie to write. Barack has his work cut out for him. The Treasury has been drained, we’re practically owned by China, we’ve got two ongoing wars, New Orleans is still a disaster and the economy has tanked. Helluva job, Georgie. You wonder if he realizes just what he has done. Personally, I don’t think he can imagine it. GWB probably thinks he’d have gone down as one of the great Presidents in history if it weren’t for all those disasters which “nobody” could have planned for, without realizing that his tax cuts, his wars, his gutting of FEMA, all contributed to our being unable to recover from disaster. George’s career has consisted of disastrous leadership of an oil company, screwing up a baseball team, and almost single-handedly wrecking America. All his life, he’s taken a dump in the middle of the floor and walked away smiling, leaving his mess for someone else to clean up. That kind of behavior is tolerable in a one-year old. George Bush is our national one-year old. But let’s not dwell on that. In spite of all the lies and distortions that John McCain and Sarah Palin resorted to in the last weeks of the campaign, America has finally lived up to its promise and elected a black man as President. It’s time to celebrate.